Each of the stocks highlighted today have a ticker symbol and company name that begin with an “A”. No, I am not trying to toss a gimmick into my research; rather, I noticed that some of the best looking stocks showing up on my screens happen to start with an “A” (so I decided to have a little fun with the title). The stock has a top relative strength rating and has been making new highs while the majority of all stocks collapsed over the past two months. The next test will be a new 52-week high on above average volume (further follow-through). 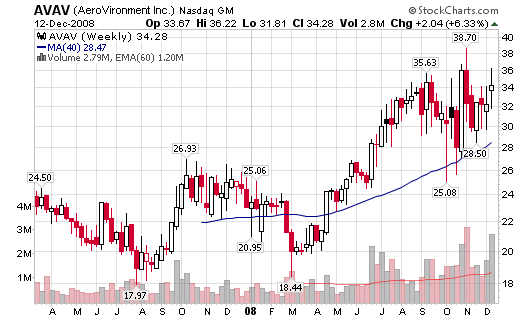 AVAV – $34.28, AeroVironment Inc. The trending stock is about to challenge a new all-time high on above average volume. 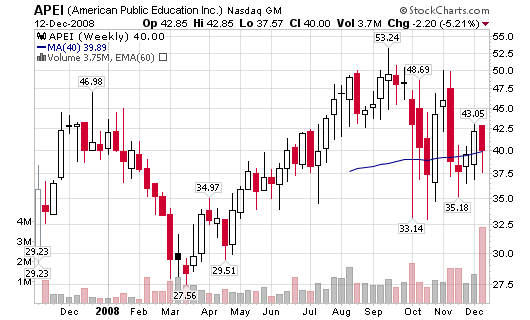 The ideal buy is closer to the 200-d m.a,, a place I first highlighted the young IPO as a “stock of interest” last June. 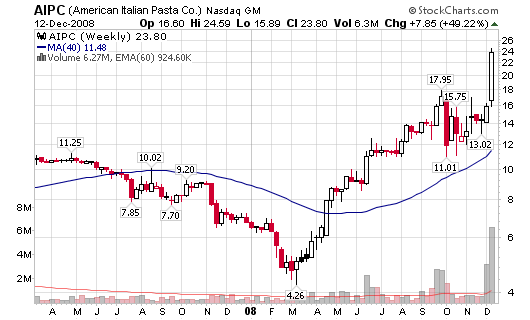 AIPC – $23.80, American Italian Pasta Co. 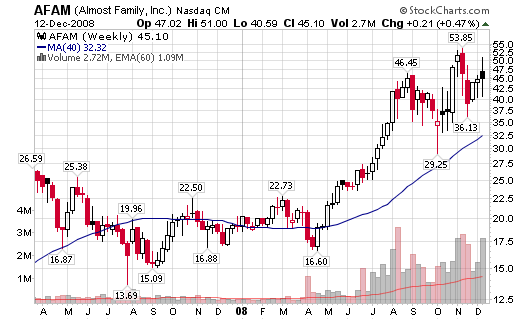 I highlighted the company last week in Strong Stock Charts at $15.95 per share, a 49% gain in one week. 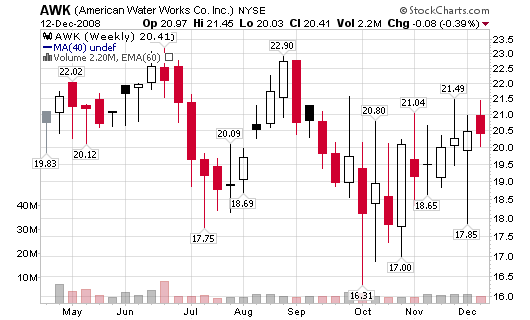 AWK – $20.41, American Water Works Co., Inc. The stock is trending higher on slightly larger volume and has held up well considering the carnage across the market. I prefer to see less daily volatility before it is to become a buy candidate on my watch list. 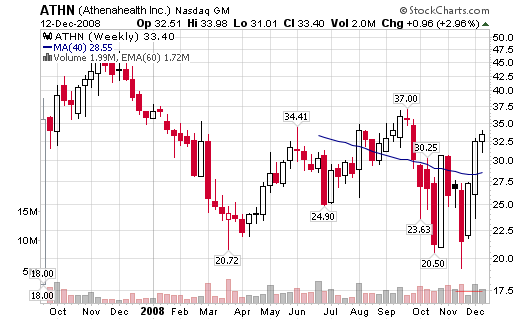 ATHN – $33.40, Athenahealth Inc. The stock recovered the 200-d moving average for the first time in five months and is starting to gain momentum on higher volume. I am fairly new to reading charts. How is this read of the AWK chart? I read it working on a double bottom pattern. The first leg of the W was on July 15 with the low of 18.09. It showed support by rallying up to 23.12 on August 29. It takes out its prior low on October 10 at 16.47. The buy point would be 23.22 (ten cents above the middle part of the “W”). Thank you. 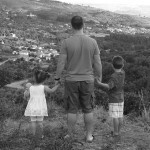 Thank you for this blog Chris. I have been reading your site for over a year along with IBD for the past couple of years. I just dont get the feeling that these stocks can lead this rally. They are too thinly traded. I think the real leaders are waiting to hatch and the time is coming sooner than many think. Do you see the market “behaving” as it should and returning to normal? I have been watching it and the strong finishes at the end of the day are encouraging. I am looking forward to this new bull market and having winning trades. Maybe so. The M in CANSLIM is still weak so I wouldn’t bet on any stock to lead at this time. However, we disagree as these stocks aren’t as thinly traded as you think, based on my experience. Great young growth stocks tend to sit on the front end of any new rally. Study past leaders and cross check their volume. You won’t find a great variance. Yes, in a strong market, you could buy at that pivot point to a new high but I prefer buys along a moving average in weaker markets. A rally must confirm before buying in weak markets.